I hope that many of you were able to hear my presentation for the African American Wisdom summit with the Shift Network. I spoke to the ashe, the in-dwelling genius that we each have inherited from the long line of human ancestors. This intelligence lies just beneath the surface of our consciousness and often goes unnoticed and un-manifested because this culture has an elitist attitude toward native intelligence. Well we’re about to shut that foolishness down and open up our eyes, hearts, and arms. 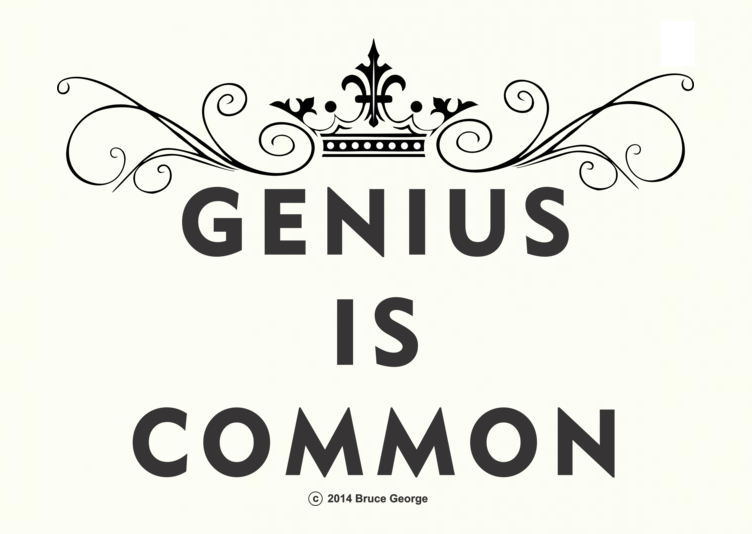 I have joined with another project GENIUS IS COMMON, led by Bruce George, whose mission is to awaken the Consciousness of everyday people, to encourage creativity and connection. I’ll be spreading the good word with increased online presence as well as real-time presentations, performance, and workshops on Ancestral Genius—Genius is Common. Another way to promote this healing is by making GENIUS IS COMMON tee shirts, pencils, coffee cups, mouse pads etc. available to individuals and groups. Let’s replace the “Pimp” and “Scarface” tee shirts with “GENIUS IS COMMON.” Let’s put the pencils, mouse-pads and coffee cups in our schools. The GENIUS IS COMMON website has short videos of our children and youth exclaiming their genius proudly. Here’s mine. Take a look, enjoy, and join me. Are you looking for a compassionate and dynamic Performer, Speaker, and Workshop Leader for your Conference or Theater event? It is my practice and pleasure to provide “edutainment” that engages the mind, body and spirit. I use storytelling, visualization, movement, ritual, and writing to awaken the genius that is common to every person. Audience members are given an experience that helps them to recognize the brilliance present in themselves, and in all people and things. The awareness that genius is common to all of us leads to mutual respect, enhances an appreciation of each other’s gifts. It’s an exciting transformation! I perform folktales from the African diaspora, and the ancient world. These tales are full of characters whose behavior demonstrates the power of Spirit, the beauty of nature and the genius of our human family. This discovery of our common genius creates an atmosphere of support for inter-racial, cross-cultural, and intergenerational dialogue to occur. These discussions are informative, lively, and inspire kinship and collaboration. In workshops I provide exercises that engage the “mythic imagination” and frees the creative spirit. This genius may manifest in several forms of creative expressions such as writing, drawing, arts & crafts, and ritual performance. yeyeluisahteish.comMy keynotes, performances and workshops address Spiritual Guidance for Youths, Women’s Empowerment, Human Freedom and Planetary Concerns. They can be tailored to accommodate your event agenda.